This week’s #BlogBumpClub is very much the holiday edition. As I write this, I’m sitting on the verandah of our mobile home, under blue Cornish skies, planning a trip to the beach later and – quite possibly – a dip in the pool. We’re staying at Trevella Park in Crantock, near Newquay, and it’s a haven of relaxation for a pregnant woman constantly needing to dip her puffy feet in cool water. I’ll admit, before coming away, I was a bit dubious about whether I’d be able to properly enjoy a holiday while 32 weeks pregnant. My holiday staples (cold gin and tonic or a white wine) were out, plus the thought of lumbering around with a big old bump and not sleeping properly at night kind of made me wonder if it was worth the effort. It’s been brilliant to spend some quality time with the (self-proclaimed) Northern Love Machine and Frog, before things get hectic as we decorate the baby’s room and I rush to meet my work deadlines before maternity leave starts – not to mention my four year old starting school next month. We never had a “babymoon” before Frog was born, but I’m starting to see the attraction of one now. Although we’re really looking forward to our new addition to the family, it’s lovely to relax as just the three of us for a little bit longer. We’ve got a couple more little trips away planned for later this month too – including a wedding in Worcestershire (I finally sorted my outfit out – choosing something to wear to a wedding when I’ll be eight months pregnant was no mean feat!). And then it’s head down, nesting mayhem and busy times preparing for the new baby. I must admit, it’s all starting to feel rather exciting now. Finally, a HUGE congratulations to Jenny at Edspire who has welcomed her Rainbow Baby into the world. 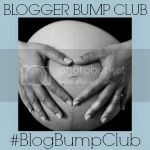 Another #BlogBumpClub baby! How’s your summer panning out so far? Have you been on holiday while pregnant? Or maybe you’re enjoying some time at home and in that mad nesting phase? Link up your latest pregnancy post to this week’s #BlogBumpClub and tell us all about it! Don’t forget to grab the badge below to display on your own blog, so other pregnant bloggers can find us and join in too. And, if you want to catch up on more pregnancy chat then tweet using the #BlogBumpClub hashtag on Twitter – I’m @mollyjforbes over there if you want to come and say hello. Looks wonderful! Glad you had a great time! Looks like you had a lovely time and had some nice weather too 🙂 I honestly thought you were abroad and not in the UK, brilliant. Hope you are having a fab holiday! It was amazing – thank you! Thank you – I think the slight tan helps! I’m so pleased for Jennie! I’m definitely jealous of the pool – that looks just blissful! And you look like you’re blooming in all the wonderful ways; having a little holiday is clearly a very good idea, especially with the beer and the crisps! It was fantastic – flew by!